A picture hanging system may be mounted to the wall, but you could also opt to mount it on the ceiling. The flexible picture hanging system Top Rail is ideal for this purpose. This ceiling rail is discreet in its dimensions (14.3 mm x 7 mm), and is available in white, aluminium and black. The Top Rail is an ideal hanging system to use in combination with recessed ceilings. By mounting the ceiling rail to the wooden side strip of a recessed ceiling, the rail ‘disappears’ into the ceiling. 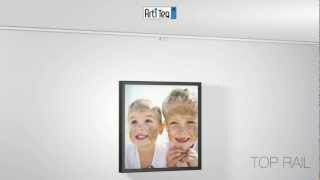 This ‘invisible’ picture hanging system then offers a flexible way to hang, change and replace pictures and wall decorations throughout the entire room. The Top Rail is also suitable for mounting directly onto concrete ceilings. 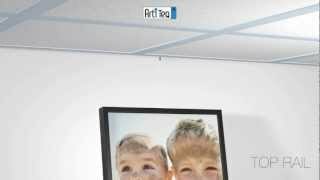 Hanging wires may be clicked anywhere you like in the ceiling rail, making hanging pictures and photo frames extremely easy and user-friendly. There is an extensive selection of hanging wires available. Use perlon to create as much transparency as possible, making the hanging wires practically invisible against the wall. Steel wire on the other hand will give your interior walls a more industrial, modern look.